Are you a visual learner? 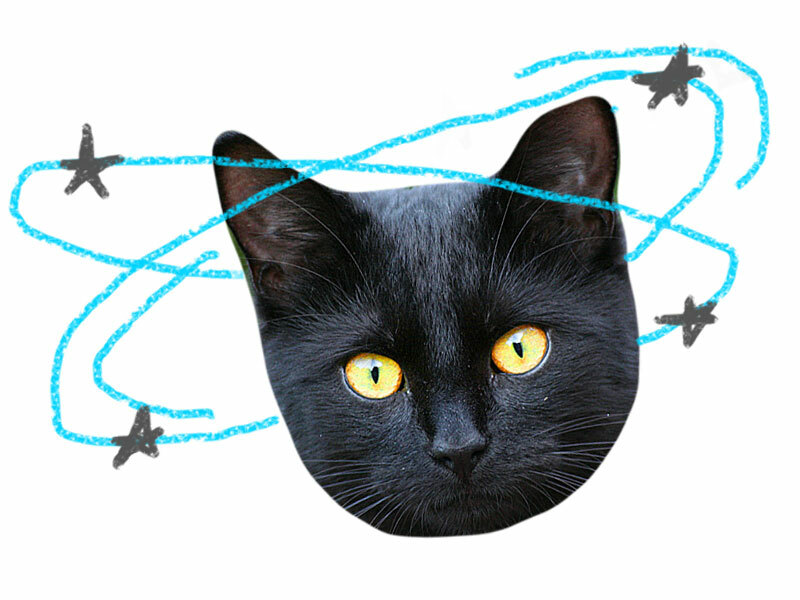 Do you resemble our bewildered friend above when trying to target elements for styling? If so, don’t worry, we’ll soon remedy that. If you’re just starting to learn basic selector syntax it can be hard to remember what does what. 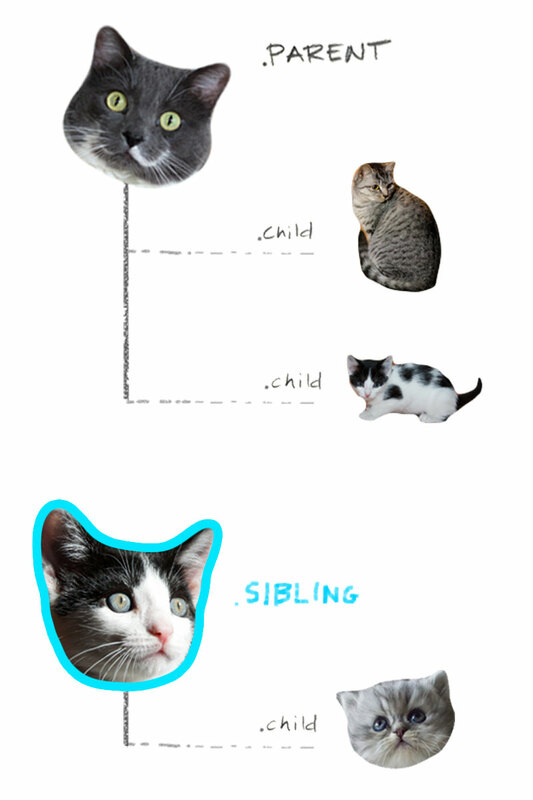 I’ve created this cat-based primer to guide you. Enjoy! Selecting a parent is as simple as using a class, id or element as your selector. Follow this with a declaration block and you’re in business. Here’s an example of the corresponding markup and styles, respectively. It’s helpful to think about children in two different ways. First, there are direct children. Second, there are descendants. 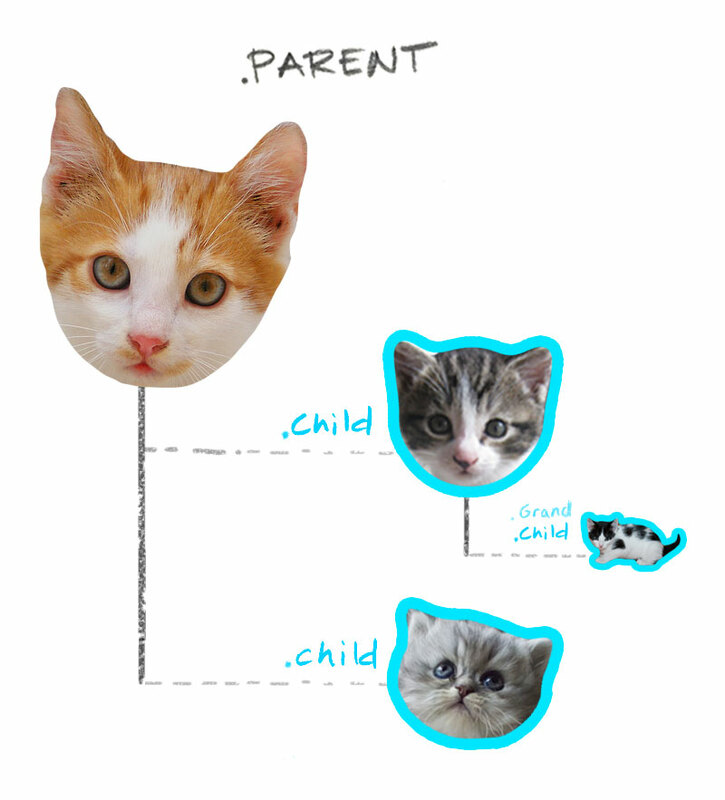 Direct children are immediately nested within a parent. Descendants include immediate children, but also any matching element further down the DOM. Placing a > between selectors tells the browser to find the first selector (the parent) and then go inside of it to find the second selector (its child). In the following example we’re looking for any element that’s immediately nested within .parent with the class of .child. The descendant selector is less specific than the direct child selector. It targets any element within a parent that has the class of .child no matter how far down the DOM tree it resides. To use it we place a space between selectors. 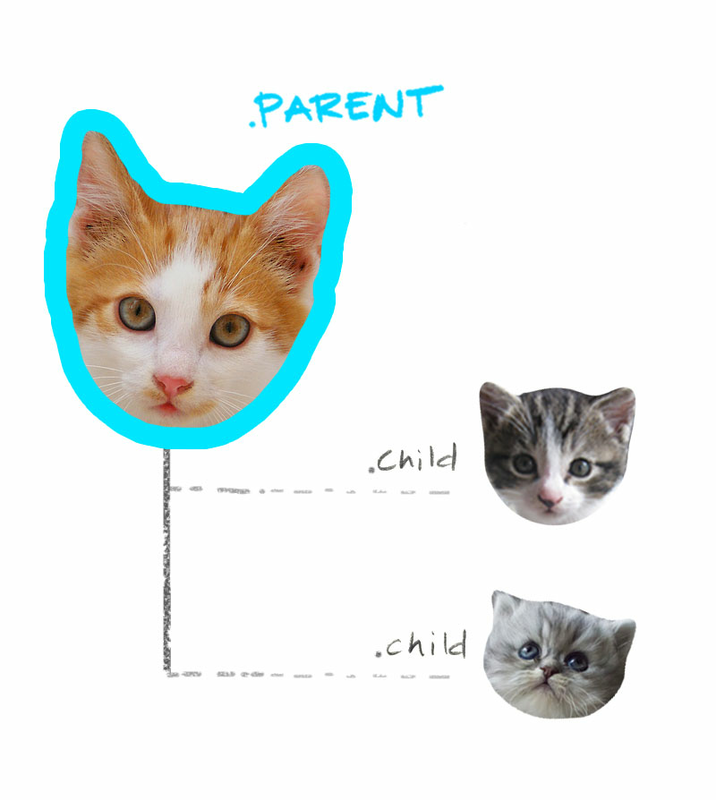 In the following example we’re looking for any element nested within .parent with the class of .child. An adjacent sibling is an element that resides next to, and on the same level of the DOM as another. Targeting them is simple. In this case what we need to do is join the selectors together with a +. Check out the example below. Sometimes you want to apply styles to multiple elements. So how does that work? The answer is quite simple. All one has to do is separate each selector with a comma. Here’s an example. To learn even more about CSS selectors (though sadly with no cats), try CSS Diner, which will lead you from basic to complex selectors using delicious food. Thanks to all the cat lovers of Flickr. All cats herded under Creative Commons Attribution 2.0 Generic.